Anyone who has experienced data loss knows that awful feeling you get in the pit of your stomach when you realize your important information is gone forever. People invest hundreds of dollars in backup hard drives, online backup services and DVD-R disks to try to prevent the loss of irreplaceable information. Despite everyone’s best efforts data loss still strikes because backup schedules are only as good as the people who run them – or forget to run them. For the first time ever you do not need to back up your computer to an external hard drive or DVDs because your backup drive is built right into your computer. The Safe and Stored Backup System backs up your computer’s main hard drive to a secondary hard drive right inside your computer. There are no drives to hook up, no disks to maintain and no schedules to set. How Does Safe and Stored Work? Once every week (or more often if you would like) the Safe and Stored Backup System takes a complete image of your hard drive including your programs and Operating System files. If your hard drive ever crashes, a mirror-image of your data can be restored to a new drive. All of your programs, settings, files, and devices will automatically work just like they used to. How Does Safe and Stored Compare to Online Backup? 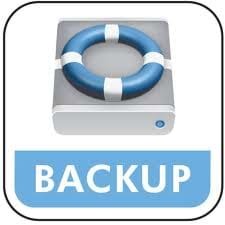 Online Backup with services like Mozy or Carbonite are great if you need an offsite backup of your data files. However, many people don’t realize that these online services don’t backup video files or files over 2 GB in size unless you specifically include each file individually in your backup. Also, in the event of a drive failure it can take over three days to download your recovered files! The Safe and Stored Backup System is a complete backup of your entire drive. Because it is stored right inside your computer it is faster to restore you have complete control over your data at all times. Call Schrock Innovations or stop in to see the Safe and Stored Backup System in action today! Sounds like a real good system of reliable regular backup for sure. And you’re right about the online backup. They are good for small files but the transfer times, particularly upload, take a long time and are thus not really fully viable alternative backup method yet.